Senate: No budget approval for agencies without audited accounts – Royal Times of Nigeria. which failed to submit at least two previous years’ audited reports to the Auditor-General of the Federation (AGF). The decision followed the adoption of a report of the Senate Public Accounts Committee (PAC) presented to the chamber by its Chairman, Sen. Matthew Uroghide during plenary. The report indicated that at least 85 agencies of government including the Bank of Agriculture (BOA) and the Economic and Financial Crimes Commission (EFCC) had never submitted audited reports since their creation. In adopting the report, the Senate issued a May 2018 deadline to all parastatals to submit audited reports in line with Section 85 of the 1999 Constitution. According to Urhoghide, out of 447 agencies and parastatals, only 40 have complied with the submission of the 2017 audit reports. He said that the constitution mandated the AGF to receive audited reports from the agencies and submit the same to the National Assembly. The lawmaker added that the agencies and parastatals should ensure that their accounts were audited by making use of the recommended auditors from the AGF. In his remarks, the President of the Senate Dr Bukola Saraki condemned the development saying that the situation was unhelpful to the war against corruption. He said: “Imagine that out of 447 parastatals, only 40 have complied with the 2017 audited reports. When they say we are not making much progress in the anti-corruption fight it is because of the fundamental issues, they are right, the foundation is still very weak. “If we have 447 parastatals and only 40 have sent their audited reports, there is a serious problem. Now, we find out that the agencies that are even meant to supervise are part of those who have not sent in their audit reports. “Now, we have taken a resolution here today to say that unless the remaining agencies do that their budgets for 2018 is withheld. “Therefore, let us remember that when we are passing the 2018 budget, the committees that are presenting the reports of the parastatals should please confirm to us whether they have complied with the auditor’s report. 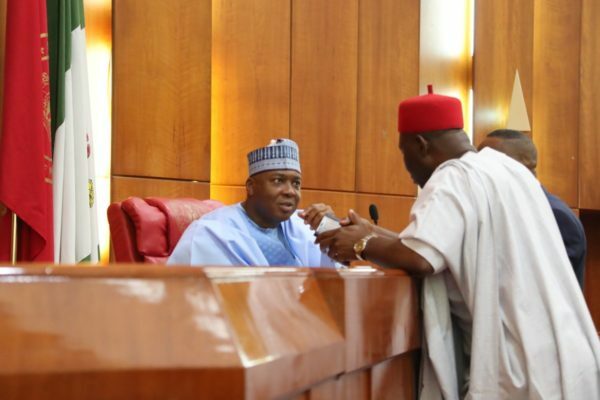 “In the meantime, we will make sure that we also communicate to the Secretary of the Government of the Federation (SGF) to ensure that all these parastatals get their accounts audited and submitted,” Saraki said.